Architecture, Fine Art, and BBQ in the Midwest – Neales…on wheels! Where did we leave off? Oh yes: overnighting at a Walmart parking lot in Wheeling, West Virginia, with a dead car battery. The glamourous Walmart truck and RV parking lot. We got the battery charged, stocked up on groceries, ate a McDonald’s breakfast, and were back on the road. Just like the pioneers! Nothing was going to stop us from reaching St. Louis, Gateway to the West. After a night in Terre Haute, Indiana, we arrived at 370 Lakeside RV Campground, a city park in St. Peters, Missouri. With the spacious sites, wide open landscape, and big sky, it really felt like we’d arrived in the Midwest. The KOA campground in Terre Haute would have been a fun place to stay for more than one night. Morning mist and the still bright moon on my walk with the dogs at 370 Lakeside. Sunset over the open field next to our campsite. Our home for the next couple nights was next to a 140-acre lake with walking/biking paths and an active waterfowl community. It was a beautiful and relaxing spot, about 40 minutes from downtown St Louis. We didn’t really get to explore the city but drove directly to the Gateway Arch, aka the Jefferson National Expansion Memorial. Of course we had to see the tallest monument in the US and the tallest stainless steel structure in the world. Architect Eero Saarinen won a nationwide design competition held in 1947, and the Arch was built between 1963 and 1965. It really is remarkable to see in person, taking in the enormous, simple shape that dramatically reflects the sun and casts deep shadows. For roadschooling, the Expansion Memorial was another encounter with Thomas Jefferson, the Mississippi River, and Lewis and Clark – who we first met in Astoria, Oregon at the end of their successful expedition where the Columbia River meets the Pacific Ocean. The Gateway Arch, with construction. We didn’t realize until we arrived that the grounds of this National Monument were under major construction. The original visitor center in the North leg of the Arch was closed. The South leg housed a gift shop, movie theater, Park Ranger desk, and elevators to take ticketed passengers up to the top. There was construction going on while we were there, which wasn’t pleasant as the kids tried to work on their Junior Ranger books, and must have been really annoying for anyone who actually worked there. The South leg under construction. A wonderful bas-relief mural in the South leg outside the movie theater. The film, on the other hand, was an unexpected gem. The National and State Park films we’ve watched have varied widely from clearly dated, basic overviews to gorgeously produced short films, like the one at Custer State Park in South Dakota that was narrated by Kevin “Dances With Wolves” Costner himself. 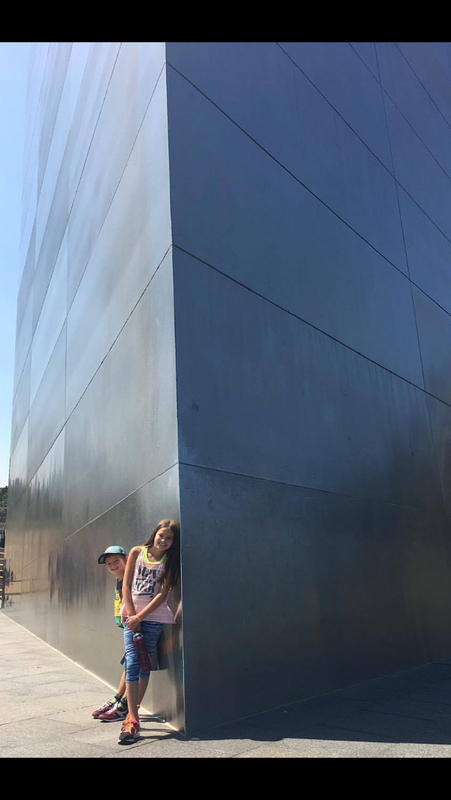 We’ve always found something to enjoy and learn from the films, but if you’re at the Gateway Arch do not miss the award-winning documentary Monument to the Dream. It was fascinating to see close-up footage of the workers methodically fitting the triangular pieces of stainless steel together, and to understand how much the engineers had to figure out themselves to make Saarinen’s vision a reality. After the film we observed the Arch up close with a new appreciation, touching the rivets and seams that were put together by hand. From St Louis we headed to Kansas City. 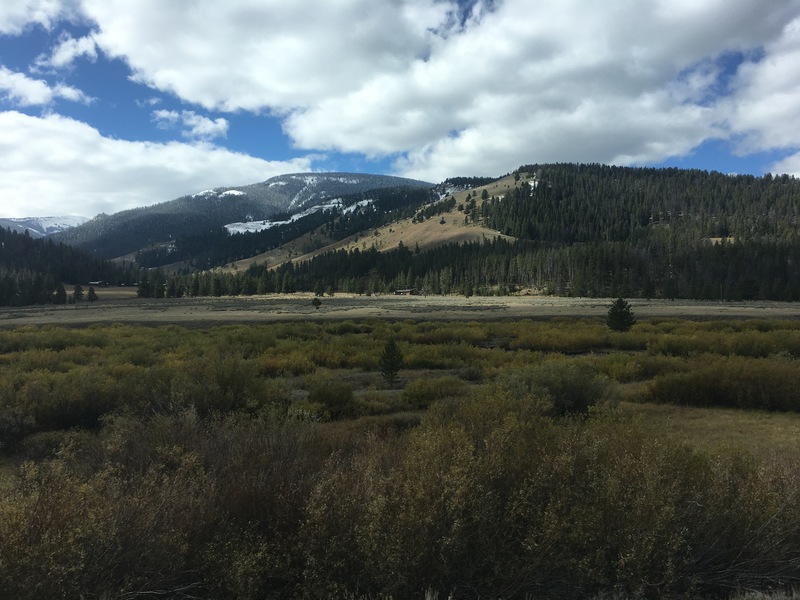 And to tell you how much time and distance have passed between when we stayed there and when I’m writing this, I could not remember the RV park until Chris jogged my memory. Blue Springs Lake Campground! No springs or lake in sight, but very spacious camp sites, a fun playground for the kids, and quiet roads to walk the dogs. This is what I didn’t remember, but we had a very pleasant stay at Blue Springs Lake Campground. Again we were outside the city, and on a Sunday while Chris found a place to watch football I took the kids to the Nelson-Atkins Museum of Art. One of the major factors of traveling full time compared to vacationing is that while we have the luxury of time, we’re not on a vacation budget, and try to stick to free or inexpensive activities (and meals). This means that we inevitably miss out on some cool sites, museums, and restaurants that we might have otherwise visited if we were on vacation, but it’s felt like a fair trade-off. We’ve discovered a lot of great parks and libraries, cheap but tasty food, and some incredible free museums like the Nelson-Atkins. The Nelson-Atkins Museum from the sculpture garden. Yoga on the lawn by Claes Oldenburg’s Shuttlecock. The kids and I spent most of our time outside on the vast lawn and contemporary sculpture garden, which includes an awesome glass labyrinth. The artworks, from Ancient to Contemporary, are housed in the original classical building, opened in 1933, and a modern addition from 2007. The collection is comprehensive but concise, and not overwhelming like a visit to the Metropolitan or the Louvre can be (especially with kids). And even though I drew a blank on our campground, I can immediately conjure up what we saw at the Nelson-Atkins: the incredible French Impressionist collection; an exhibition of Dorothea Lange and other Depression-era photographers; ancient Egyptian coffins and statues (that Charlie wanted no part of); and a contemporary work that we would have only admired in passing if a docent didn’t stop and engage us. The original and contemporary buildings of the Nelson-Atkins. Glass Labyrinth by Robert Morris. We had the labyrinth to ourselves and the kids went through several times. Charlie only bonked his head twice. Using stencils based on African American art to make bookmarks in the Bloch Building. Ignoring Monet’s Water Lilies, and breaking their mother’s heart. Thanks to a friendly docent, we learned that this gorgeous piece by El Anatsui from Ghana is constructed from liquor bottle caps and copper wire. The docent has a small sample of the caps held together with wire to illustrate how labor-intensive this work is, and also how light the material is compared to how it looks. The docent also explained that the artist left it up to the museum to choose how to drape the “fabric” when displayed. Of course, we couldn’t leave Kansas City without having some bar-b-que, and on our way north to Nebraska we swung into Kansas City, Kansas to have lunch at Joe’s Kansas City BBQ. Housed in a former gas station, the large and casual restaurant had a line out the door when we arrived, but it was kept moving steadily and the tables turned over and cleaned by the awesome staff. What a treat! We had a delicious feast of brisket, pulled pork, burnt ends, Texas toast, fries, red beans, and Kansas caviar. Between amazing BBQ and art in Kansas City, it’s no wonder I don’t remember our campground. Joe’s Kansas City BBQ lived up to the hype! Up next: Visiting friends in Lincoln, Nebraska, and our push northwest into Montana. I know ahead of time where you are but I’ve so enjoyed your trip and will miss it. I hope you keep updating sometimes. Oddly, the most fascinating item on this post is the El Anatsui artwork. I would love to see that up close. Thanks for including me on your journey! Thank you, Kathy. Our adventure hasn’t ended, we are just starting a new phase 🙂 I’m planning on continuing to share photos and stories! I’m so glad you liked the El Anatsui work, isn’t it wonderful? Nice post. Looks like a fabulous adventure. Im not too far from St Louis, so I certainly appreciated seeing someone else enjoying the Midwest as much as I do. Love the photos. Thanks for sharing. Thank you so much, I appreciate it! We really enjoyed our trip through the area… would love to come back to spend more time and explore!